Our Harvest Reflection is courtesy of Augusta Canal. Consistency isn’t my thing, folks. But, that doesn’t stop me from attempting to make it my thing. It’s not that I don’t have any consistency. I just don’t have mastery over it. If we liken consistency to the horses we ride through life, mine is a wild donkey. I’m not cut out for the wagon train. I’m a happy, content person running along through the fields with my wild donkey, stopping to smell the flowers. And, try as I might to join in, I just get trampled by the wagon train that stretches in a line as long as the equator. It seems like everybody else and their team of Clydesdales all heading the same way, doing the same thing, they have this mastery over what people want and how to give it to them…. I am a master of nothing and if I’m being brutally honest, I don’t know much either. 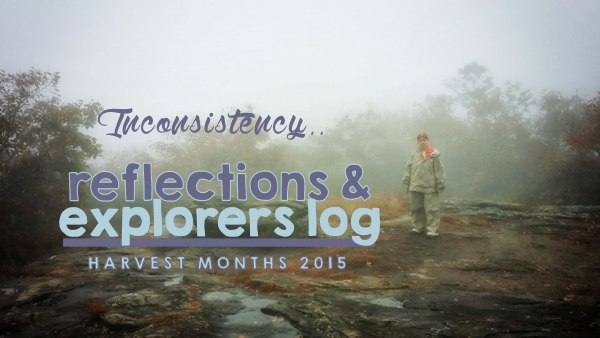 So, for 2016, I’m going to focus on letting go of this fear that my inconsistency will fail me…. I mean, we’re usually a decade behind everyone else, but this wild donkey has carried me this far.. I don’t qualify for any trophies, but that’s just one less thing to carry. August 4: Aska Adventure Area MTB Trails – Read on Explore Georgia! August 6: Little Kennesaw Mountain –Read about this great hike! August 8: Sweetwater Creek State Park – Read about this great park! Sept 5: Allatoona Creek MTB Trails – Read on Explore Georgia! Sept 12: Allatoona Creek MTB Trails – Read on Explore Georgia! Sept 14: Allatoona Creek MTB Trails – Read on Explore Georgia! Augusta, GA – International Disc Golf Center –Read on Explore Georgia! Sept 20: Augusta, GA – Kayaking Augusta Canal – Read on Explore Georgia! Augusta, GA – Phinizy Swamp Nature Park – Read on Explore Georgia! Sept 24: J Bear turns 12! Oct 10: Blood Mountain Summit – Read on Explore Georgia! Nov 8: Jackson County’s Geocaching Heritage Trail – Read on Explore Georgia! Nov 11: Chickamauga & Chattanooga National Military Park – Read on Explore Georgia! Nov 27: Chicopee Mountain Bike Trails – Read on Explore Georgia!